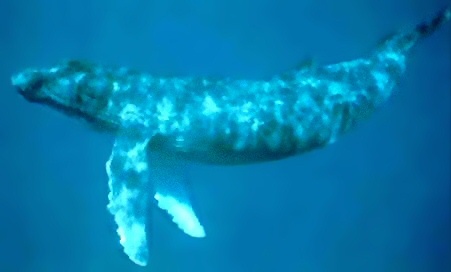 Whales — particularly humpback whales like the one pictured above — speak. Their language is not an articulate mix of sounds like we humans make, but some, such as the aforementioned humpbacks, have taken to making sounds akin to singing. It is widely believed by the relevant scientific communities that these sounds are how members of these species communicate with one another. Which is why a whale dubbed the 52 Hertz whale is, forever, alone. Most whale sounds occur in the 15 to 25 Hertz frequency range; you can listen to a humpback whale’s call here. But the 52 Hertz whale, uniquely (as far as we know) creates a sound at a much higher frequency, as heard here. And unfortunately for the 52 Hertz whale, this massive difference in frequency means that it cannot communicate with the other whales in the ocean. Scientists at the Woods Hole Oceanographic Institution (WHOI) have been tracking the whale since detecting its strange noise in 1992 using hydrophones, a series of underwater listening devices originally used to track submarine movements. The team was suprised, to say the least. As reported by the New York Times, “its sonic signature is clearly that of a whale, but nothing like the normal voice of the giant blue or the next biggest species, the fin, or any other whale for that matter” per a WHOI marine biologist studying the whale. Further, the WHOI team believes that the whale is in otherwise good health, noting that it would be extremely unlikely that a creature with compromised health could live in solitude for over a dozen years — as the 52 Hertz whale has. Its life of solitude is exhibited also by its odd migratory pattern. The 52 Hertz whale typically travels up and down the Pacific coast of Mexico, the United States and Canada, venturing into the Gulf of Alaska but not venturing further north. (Here’s a map.) According to the Alaska Dispatch, the gray whale migrates in a similar path, but ventures much further north to feed; the 52 Hertz whale never reaches that feeding ground and is therefore not likely part of that pack. As of January 2012, it was last detected south of Alaska, alone, as usual. In fact, we don’t know what species of whale the 52 Hertz is. While some believe it is a species in and of itself — perhaps the last whale of its kind — WHOI believes that is not the case. Rather, WHOI believes that it is simply a strange, unique member of something otherwise well known. Bonus fact: The blue whale is the world’s largest animal. It is so large that its tongue alone weights about 3 tons (or about 2,700 kilograms). For comparison’s sake, the largest land animal, the African bush elephant — the whole thing, not just the tongue — weighs about six tons. From the Archives: Sounds From the Deep: Other odd sounds picked up by hydrophones (and a brief glimps into why the hydrophonic network exists in the first place). Related: A six foot long rideable whale pool toy.